Pain felt in any part of the face is considered face pain. This includes the eyes, nose, and mouth. Facial pain is one of the top reported complaints in emergency and outpatient medical visits. The pain is generally described as sharp, throbbing, aching, and sometimes turns into pressure or tingling in the face. Face pain is a very common condition and can be caused by numerous ailments, with the most frequent being headache or injury. Migraine headaches are usually associated with unilateral, throbbing pain in the face. In certain cases, facial pain can develop from a severe medical condition or originate from a different location in the body. 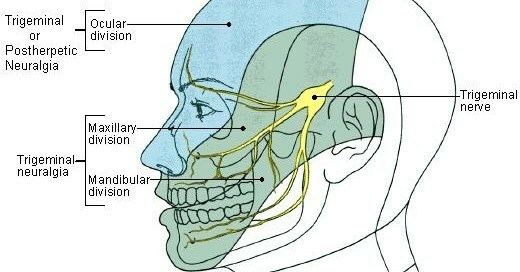 The trigeminal nerve (cranial nerve V) in the brain is the nerve that controls sensation communication from the face to the teeth, mouth, and nasal cavity. 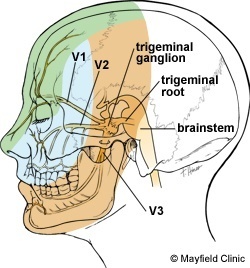 The trigeminal nerve is made up of three divisions; the ophthalmic division (V-1), the maxillary division (V-2), and the mandibular division (V-3). Each of these divisions affects sensory innervation to different parts of the face, which can result in various types of pain being transmitted. Neuralgia is a type of nerve pain that occurs when neurological structures or functions are altered due to the inflammation or damage of a nerve. 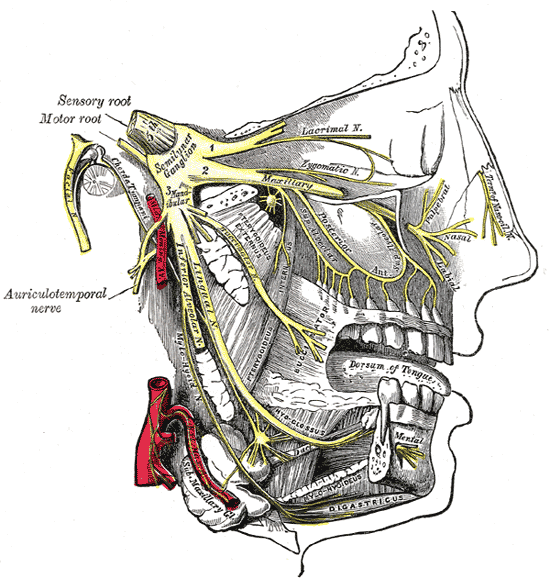 Trigeminal neuralgia is a type of nerve disorder that can cause stabbing, electric-shock type pain in the face. Numerous experts claim that it is one of the most painful conditions a patient can experience. Statistics show that about 45,000 people in the United States have trigeminal neuralgia. The condition occurs when a blood vessel exerts pressure on the nerve located at the base of the brain. Patients who suffer from trigeminal neuralgia sometimes have trouble eating, speaking, and completing daily functions. 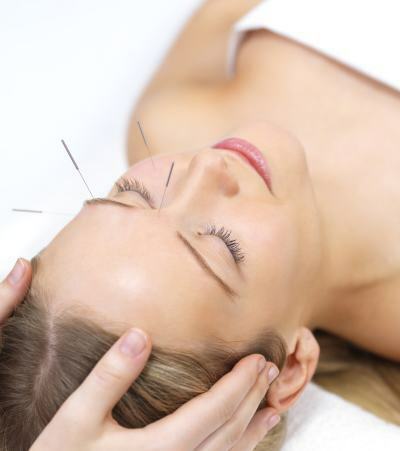 For patients who have mild cases of face pain, alternative therapies are an additional option. Acupuncture, chiropractic pain management, and relaxation and guided imagery have been reported to provide effective pain relief. This type of treatment is also beneficial for those patients who are not viable candidates for other treatments due to an existing health condition. Patients experiencing face pain due to migraines are usually treated with pain relieving medication or nonsteroidal anti-inflammatory drugs (NSAIDs). If these milder forms of treatment are not effective, antidepressant medication, or opioid medications may be prescribed by the physician. Treatment for face pain caused by dental problems or dental disease is generally easy to treat since the origin of the pain can be easily determined and corrected by a dentist. Pain caused from sinus inflammation or infection is similar, as a physician will be able to recommend a treatment option that will rapidly clear the patient’s symptoms. Temporomandibular joint disorders which result in face pain are most often treated with joint injections, anti-inflammatory drugs (NSAIDs), and regular chiropractic sessions. Trigeminal neuralgia can be treated in a number of ways depending on the severity of the patient’s symptoms. Most common treatments are anti-inflammatory drugs (NSAIDs), antidepressants, opioid medications, occipital nerve blocks, and sphenopalatine ganglion blocks. Botulinum toxin type A has also produced high success rates of relieving face pain in trigeminal neuralgia patients. For more severe cases, neuromodulation treatments are sometimes recommended, for example, peripheral nerve stimulation and spinal cord stimulation. Face pain is a widespread problem that most people will experience at some point in their lifetime. Whether it is caused by migraines, sinus infections, injury, or dental problems, the pain can be debilitating. In serious cases, face pain can be caused by trigeminal neuralgia, which is known to be one of the most painful conditions the human body can endure. Treatment therapies for mild and severe cases have produced successful results with decreasing face pain and in some instances, completely eliminating the patient’s painful symptoms. At Nevada Pain our goal is to relieve your face pain and improve function to increase your quality of life. Aguggia M. Typical facial neuralgias. Neurol Sci. 2005;26Suppl2:s68-70. Annino DJ Jr, Goguen LA. Pain from the oral cavity. Otolaryngol Clin North Am. 2003;36(6):1127-35, vi-vii. Cornelissen P, van Kleef M, Mekhail N, Day M, van Zundert J. Evidence-based interventional pain medicine according to clinical diagnoses. 3. Persistent idiopathic facial pain. Pain Pract. 2009;9(6):443-8. Hall GC, Carroll D, McQuay HJ. Primary care incidence and treatment of four neuropathic pain conditions: A descriptive study, 2002–2005. BMC Fam Pract. 2008;9:26. Kaniecki R. Headache assessment and management. JAMA. 2003;289(11):1430-3. Obermann M, Katsarava Z. Update on trigeminal neuralgia. Expert Rev Neurother. 2009;9:323–329. Ogutcen-Toller M, Uzun E, Incesu L. Clinical and magnetic resonance imaging evaluation of facial pain. Oral Surg Oral Med Oral Pathol Oral Radiol Endod. 2004;97(5):652-8. Rasmussen K, Jensen R, Schrod M, Olesen J. Epidemiology of headache in a general population: a prevalence study. J Clin Epidemiol. 1991;44:1147-57.